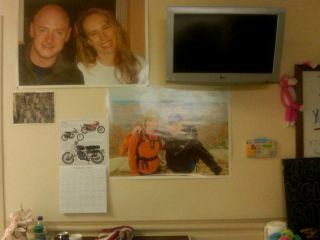 Photos of loved ones and other inspiration adorn Congresswoman Giffords' hospital room. Arizona congresswoman Gabrielle Giffords, who is recovering from a bullet wound to the head, is relearning how to speak with the help of her doctors, friends and family - including her brother-in-law in space, according to the New York Times. Over the weekend, the wounded politician made a very long distance phone call – 226 miles above Earth to her brother-in-law, Scott Kelly, who is currently living and working onboard the International Space Station, the New York Times reported. On Sunday afternoon (Feb. 13), Giffords' astronaut husband, Mark Kelly, placed the call to his identical twin brother (and fellow NASA astronaut) Scott Kelly, who is the commander of Expedition 26 mission on the space station. Giffords reportedly said, 'Hi, I'm good,' to her brother-in-law, according to the New York Times. Rep. Giffords (D-Ariz.) was shot in the head Jan. 8 when a gunman opened fire while she was speaking at a constituent meeting outside a grocery store in Tucson. The attack killed six and injured 13. "We hold Gabby and her family in our thoughts and prayers, especially her husband Mark Kelly," NASA administrator Charlie Bolden said in a press briefing today (Feb. 14) before unveiling the space agency's budget request for 2012. In TV interview last month, Mark Kelly told ABC's Diane Sawyer that Giffords' progress since her injury has been, "nothing short of a miracle." Giffords is presently undergoing rehabilitation in Houston as her husband resumes training for his upcoming space shuttle mission, which is scheduled to launch April 19. Mark Kelly is commander of the STS-134 mission, which will be the space shuttle Endeavour's final flight to the International Space Station before the orbiter is retired. On. Feb. 4, Mark Kelly announced his decision to remain in command of Endeavour's final mission, ending weeks of speculation as to whether he would opt instead to remain by his wife's side as she recovers. Mark Kelly told reporters that his wife is making incredible progress in her recovery, and that ultimately, she would want him to carry on with the mission.